These black hiking socks are just right for active women, who want to be accompanied by the best SCHIESSER quality step for step. A well thought out material composition ensures a soft, light feeling on the skin, which is breathable and at the same time ensures an optimal moisture regulation. 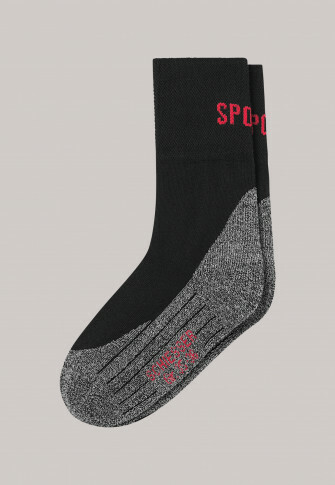 Whether it's for sporty hiking trips, an enjoyable walk or walking around the city, these socks indulge your feet year-round with maximum comfort! leichte Trekkingsocke für sommerliche Temperaturen. Gefallen mir optisch gut, angenehm vom Griff. Getragen habe ich sie noch nicht. Qalitativ hochwertig - weich und angenehm warm - keine Nähte, die an den Zehen reiben - hatte sie bei Winterwanderung bei Minusgraden in normalen Wanderstiefeln an - hat voll ausgereicht - Bündchen könnte etwas länger sein.